Obituary: Rabbi Aaron D. Panken, Ph.D.
H-Judaic mourns the tragic and untimely passing of President Rabbi Dr. Aaron D. Panken, the 12th President of Hebrew Union College-Jewish Institute of Religion, who was killed in a tragic private plane crash. He was 53. We are terribly saddened to announce the untimely death of Rabbi Aaron Panken, Ph.D., President of Hebrew Union College-Jewish Institute of Religion, who died tragically in a plane crash on May 5, 2018. He served as the 12th President in HUC-JIR’s 143-year history. Dr. Panken led the four-campus international institution of higher learning and seminary for Reform Judaism. HUC-JIR’s campuses in Cincinnati, Jerusalem, Los Angeles and New York provide the academic and professional training programs for the Reform Movement’s rabbis, cantors, educators, and nonprofit management professionals, and offer graduate programs for scholars of all faiths. HUC-JIR’s 4,000 active alumni serve the Reform Movement’s 1.5 million members and nearly 900 congregations, representing the largest Jewish denomination in North America, and the growing Progressive Movement in Israel and around the world. Rabbi Panken was a distinguished rabbi and scholar, dedicated teacher, and exemplary leader of the Reform Movement for nearly three decades. As a product of the Reform Movement’s camps, youth movement, and seminary, his passionate commitment to Reform Judaism, to the State of Israel, and to the Jewish people worldwide inspired his efforts to ensure HUC-JIR’s academic excellence in fulfilling its sacred mission. As HUC-JIR President, Rabbi Panken implemented his transformative vision by forging strategic planning initiatives: embedding new technology in support of student learning and administration, strengthening recruitment to yield the largest incoming classes in a decade, launching new Jewish education, nonprofit management, and entrepreneurship programs and academic partnerships, and invigorating the ties linking HUC-JIR’s four campuses in Cincinnati, Jerusalem, Los Angeles, and New York and their larger communities and regions. He was a staunch advocate for religious pluralism in Israel and was proud to have ordained the 100th Israeli Reform rabbi graduating from HUC-JIR’s Israeli Rabbinical Program on November 16, 2017. It was his vision to renovate and transform the Jerusalem campus into a dynamic educational and cultural center for the larger public. He exponentially increased the number of Israelis studying for the rabbinate, as educators pastoral caregivers, and interfaith teachers for tolerance on the Jerusalem campus. Rabbi Panken was elected HUC-JIR President by the Board of Governors on July 31, 2013. His appointment was effective on January 1, 2014 and he was installed on June 8, 2014 in Cincinnati. Ordained by HUC-JIR in New York in 1991, Rabbi Panken previously served as Vice President for Strategic Initiatives (2007-2010), Dean of the New York Campus (1998-2007), and Dean of Students (1996-1998). He joined the HUC-JIR faculty in 1995, and taught Rabbinic and Second Temple Literature, with research interests in the historical development of legal concepts and terms; narrative development; and development of holiday observances. His publications included The Rhetoric of Innovation (University Press of America, 2005), which explored legal change in Rabbinic texts, the newly published, co-edited Engaging Torah: Modern Perspectives on the Hebrew Bible, and articles in leading academic journals and scholarly volumes. 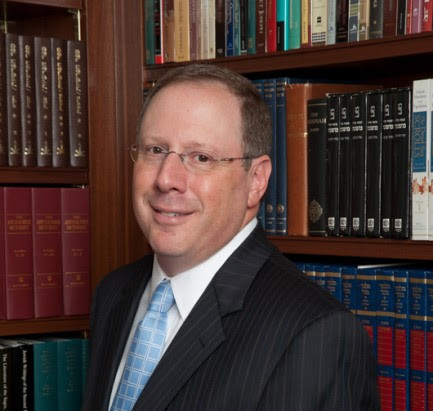 An alumnus of the Wexner Graduate Fellowship, Dr. Panken earned his doctorate in Hebrew and Judaic Studies at New York University. He was on the faculty for the Wexner Foundation and the Editorial Board of Reform Judaism Magazine, and served on the Rabbinical Placement Commission, the Birthright Education Committee, the CCAR Ethics Committee, and in a variety of other leadership roles within the Reform Movement and the greater Jewish community. He lectured widely at academic conferences and synagogues throughout North America and as visiting faculty at universities in Australia and China. Prior to teaching at the College-Institute, he served as a congregational rabbi at Congregation Rodeph Sholom in New York City and as a rabbinical intern at Westchester Reform Temple in Scarsdale, NY. A native of New York City who graduated from Johns Hopkins University's Electrical Engineering program, Rabbi Panken was a certificated commercial pilot and sailor. Rabbi Panken is survived by his wife, Lisa Messinger, his children Eli and Samantha, his parents Beverly and Peter, and his sister, Rabbi Melinda Panken of Congregation Shaari Emeth in Manalapan, NJ. H-Judaic extends deepest condolences to the Panken family.